With School Starting, Fall is right around the corner! Get a jump on your Holiday Cards this year and book one of our Fall Family Day appointments. Email here or Call 210-497-3809 to set up your appointment. Faith and Family Portraits coming the entire month of September. 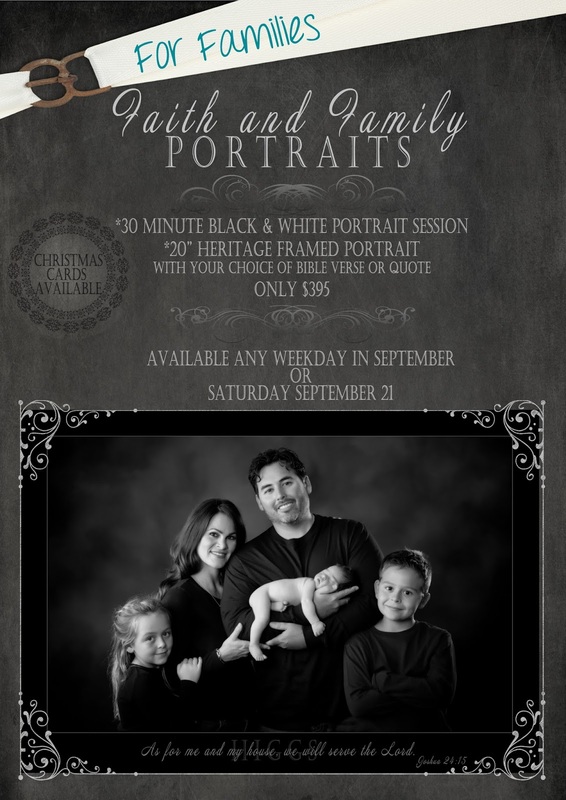 This is your chance to get a stunning black and white or sepia family portrait before the rush of the Holiday Portrait Season. Each Wall Portrait comes with your choice of Bible Verse, Favorite Quote or you can choose to have nothing imprinted on the portrait. We have several ideas for verses and quotes or you can give us your own. These make beautiful Christmas Cards and Gifts for the Holiday Season. While the session is ideal for families, of course we can also photograph just the children or any combination that you would love to have a portrait of. 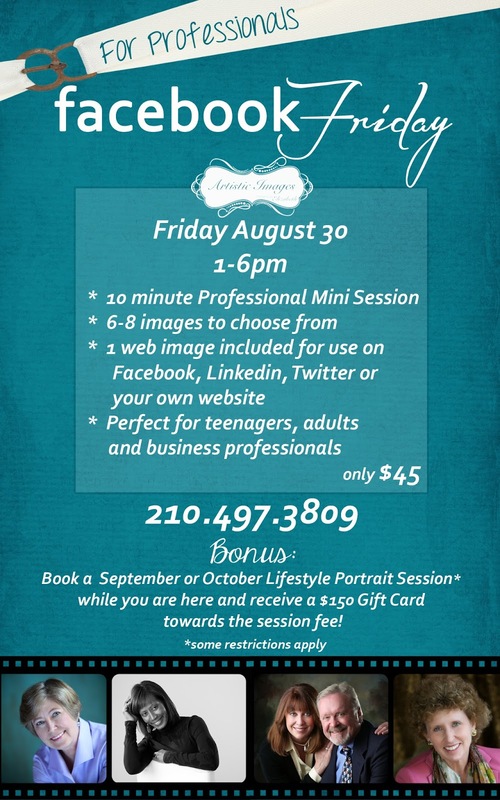 Usually a business headshot and digital file will cost upwards of $300. This is your chance to get it at a STEAL! In fact, you can buy as many poses as you want for only $35 each (after the initial investment of $45). 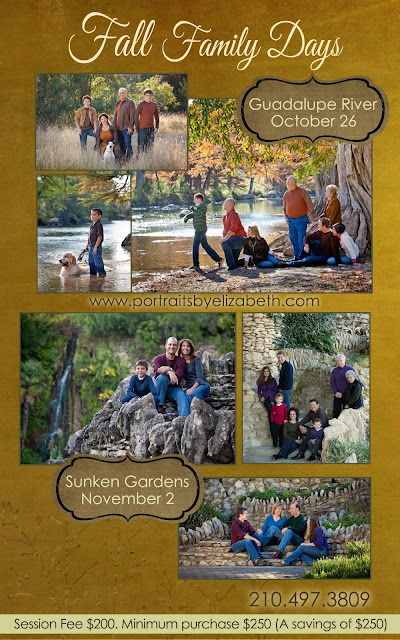 Tell all your friends and co-workers first, and then book a quick and painless mini-session with Master Photographer Elizabeth Homan. Times will sell out, so give us a call asap! Believe it or not, summer is coming to an end. My kids are truly bummed about that. They have had an adventurous summer as we traveled to several beaches, enjoying the sun and the surf while spending sunrises and sunsets photographing some beautiful families. We are currently in the planning stages for NEXT summer's (2014) Destination Portrait Adventures. We would love to add another session to our calendar while we are there! As of 10/23/13...Costa Rica CANCELLED....Now Open For Another Destination! Paris, France...The Eiffel Tower, the sidewalk cafes, the beautiful churches, Paris is the City of Love! As of now, I have an engagement in the Loire Valley June 15-20 and am available either the few days before that or the few days after that. This is a unique opportunity that may not come again! Hawaii...One of our favorite portrait locations, we have decided to Island Hop this time! July 4-9 is the Big Island of Hawaii and July 9-14 is Maui. 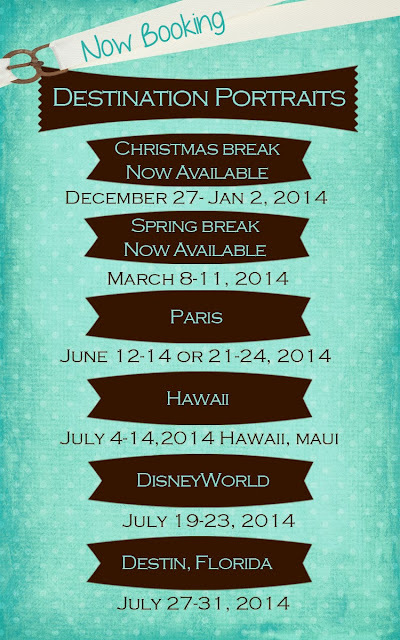 We already have THREE families committed, so don't delay making your plans! Orlando...Aka Disneyworld! We are heading to our son Jacob's biannual conference for his genetic disorder (www.pmsf.org) and of course we have to see Mickey. We can take no more than TWO sessions and the last time we did this it was SOLD OUT! Call asap if you want to be one of the lucky ones! Destin...Another favorite beach portrait location, Destin's white sand and turquoise water makes for some stunning portraits. It looks like we will be heading there on our way back from Orlando and we will stay as long as we have people to photograph. This is popular each year! South and North Padre Island...We have tentatively set the dates for these sessions. It is up in the air if we are going to North or South Padre, but we are planning on August 8-12, 2014. If you are interested in one of these locations, simply call the studio to chat about the location that interest you. These sessions usually have a special price and will be posted as we get closer to the dates. All other locations have a session fee of $650 (2-3 hour session at 1-3 locations) and a minimum purchase of $2000. Click HERE for more information about Pricing.